The new guitar and bass pedal was designed by former DigiTech mastermind Tom Cram. 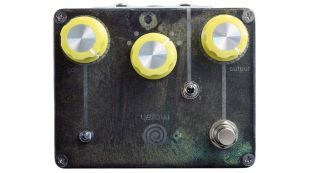 Spiral Electric FX has unveiled its new Yellow Spiral Drive pedal. The pedal's circuit is based on the DOD 250, but also features a Nanolog N2 Quantum Junction, Girth control and selectable clipping sections. The Yellow Spiral Drive is available now in a number of different, one-off oxide finishes for $249. For more info, head on over to spiralelectricfx.com.